Today’s teens face challenges that were unforeseen only a few years ago, so parents need all the help they can get to help their children succeed in school and in life. 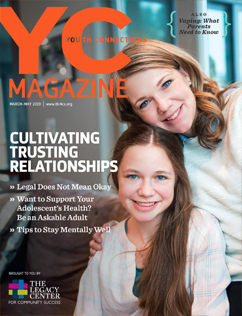 Youth Connections magazine provides information to help parents guide their children through the transitional, and tricky, stage of adolescence. The magazine is published quarterly by The Legacy Center for Community Success, in partnership with Bullock Creek Schools, Coleman Community Schools, Meridian Public Schools, Midland Public Schools and Windover High School. Nearly 6,000 copies are mailed to the parents of 6th through 12th grade students, and another 500 are distributed to several other locations throughout the community.